It’s almost lunchtime on Thursday 12th July and I’m scrolling through my Facebook feed to see what’s going on in the World with my friends, secretly wishing I was cruising the roads of East Yorkshire on my Harley and desperately trying to avoid doing the mountain of work on my desk. A post from the Hull East AFVBC – Barker’s Breakfast Club group by the legend that is Del Hardman catches my eye. 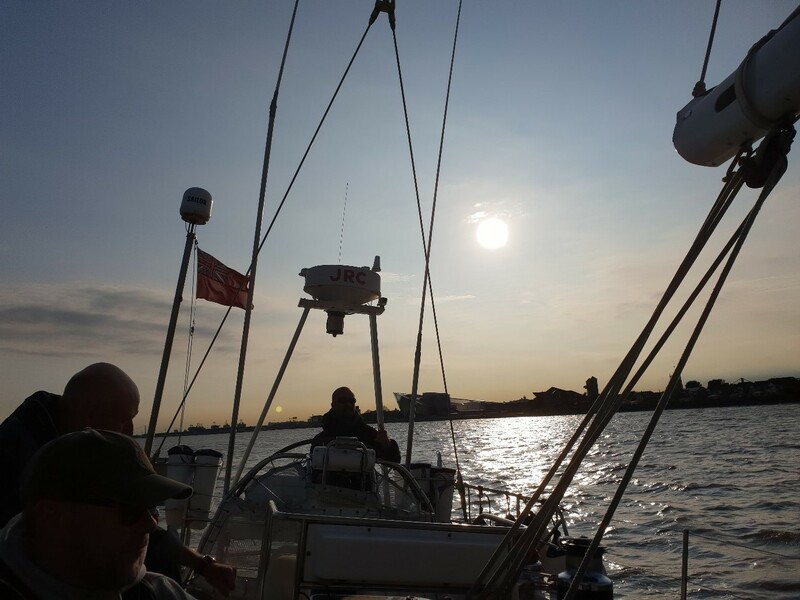 Del had been contacted by Catzero who needed volunteers to go out on their racing yacht the following day to publicise a project they are putting together to help veterans get back on their feet and into employment. They have previously specialised in helping young people get back to being productive members of society by offering a 12 week course providing guidance and support as well as personal development opportunities culminating in an eight day sailing expedition. I have been eyeing up their 72 foot Round the World Racing Yacht called Catzero since I had completed a powerboat course at the Hull Marina where it is moored. It is possibly the best looking boat in the marina and I jumped on the chance to go out on it. Friday came around and I tried hard not to think about the upcoming sailing whilst I attempted to clear my desk for the weekend. It was just before 1600hrs when I arrived and was greeted by Pete Tighe, a Programme Manager with Catzero, who introduced me to the other veterans who will be making up today’s adhoc crew for the Catzero. As an officer, and in my role as Chairman on the Hull Branch of The Yorkshire Regiment Association, I am always keen to hear the stories of veterans on how they have coped on the outside of military life. Hearing the success stories as well as the issues people have had since leaving gives me the ammunition I need to help out where I can, and to motivate those that may need it. It is also fun to slip back in to the banter that flows through all branches of the military when we get together. We had Royal Navy, Army and RAF personnel on board which meant for some gentle ribbing between the services. One thing that we didn’t lack was the drive to succeed and to help out which is one of the best qualities a veteran can draw upon on leaving the service. The eagerness to help out, the support for those carrying out a task and the unquestioning response to orders from members of the crew team who were considerably younger than us veterans, meant we had a fantastic sailing up and down the Humber where we took it in turns learning the rigging and steering the boat. It is these innate and hard earnt qualities that were forged during the crucible of basic training that I try to remind veterans in need of help of. Reminding them that, in a previous life, they were Alphas, they achieved their mission no matter the cost. That they achieved great things and endured countless hardships that civilians can only gain a false, media driven, perspective on. The qualities on show today, prove to me that a veteran just needs to remember their worth and value and what they achieved during their service in order to succeed and not give up in civilian life. I know it can be hard in a sometimes uncaring and unhelpful civilian life, but we have all been through much harder experiences in our previous lives, we just did it in a team. That team is still there; evidenced by the many and expanding number of veterans breakfast clubs growing throughout the Globe. We may not be wearing uniform anymore be we do need to remember we were warriors once. Catzero will be running their first veteran specific development course starting in September or October. Anyone interested in taking part should contact Catzero directly on: 01482 333303 or email them on: info@catzero.org.